What is a Closed Louvered Shutter? Let’s discuss our Closed Louver shutter style. 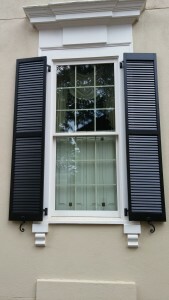 Thinking of replacing or adding traditional louvered shutters? How about considering our closed Louver design that provides greater strength, looks and feels like the traditional louver, and made completely from our rot, insect and moisture resistant composite wood material. What is a closed louver? In place of the open individual slats that is traditionally used, we cut solid pieces that fits together to form a uniform construction. 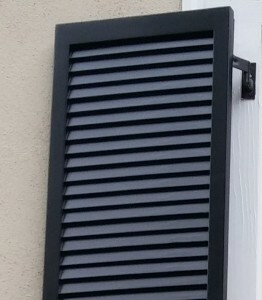 There are no openings between the louvers, and you get a solid shutter that looks like traditional louvers. Unlike open louvers where you have open slots between each slat, you get a solid shutter. That prevents leaves, pine straw and other debris to get stuck between the slats. Insects don’t nest between the slats. It’s easier to clean. Because of the closed design you can easily hose them off. It uses less paint. With less surface area it is easier to paint them in a few years. It is a much stronger design. Since the individual pieces fits together tightly, you get an almost solid shutter with strength points all around, versus an open louver design where you have strength points only at the corners. We are able to offer the closed louvers at a lower price point, since they are easier to make and we do not have to cut and fit each individual slat. It comes down to less man hours, with the resulting less cost. The closed louver design has been out in the market for some time, but not many people realize that it’s available. It is cheaper to produce and it’s a much stronger product. Combine that with the easy maintenance, its longevity and the fact that it looks like the real thing, and you end uf with a shutter that will enhance the look of your house for years to come without the hassle. Contact us today if you are in the market for louvered style shutters, and we’ll set up an appointment to show you our product at your house. In this photo we have our closed louver design hanging on the left side of the window, with the original open louver on the right. Posted in News | Comments Off on What is a Closed Louvered Shutter?